I was fortunate enough to have been selected to try L'Oréal's Hydra Total-5 Ultra Even products as part of Influenster. I received the products free to try. The opinions are all my own. I'm going to start by saying, I came in to this with no skin care regimen. I mean, none. I very rarely wear makeup, but when I do, I typically take it off with soap and water (gasp). The only products I really use on my face are sunscreen, and the odd moisturizer if I notice my skin is looking dry. I'm what you call low maintenance.... probably too low, but I digress. L'Oréal's Hydra Total-5 Ultra Even products offer a 3 step skin care regimen: 1 - cleanse; 2 - tone; 3 - care. I received 4 products in my box: scrub/exfoliant, toner, ultra-even lotion and ultra-even moisturizer. Welcome back to my tips for traveling to Disney on a Budget. 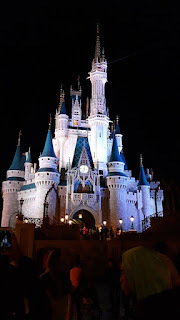 Just a quick mention once again that my tips from my previous two posts can also help with travel to other areas as well, but given that these are the tips I've used myself when booking Disney, I've kept to that theme. Missed the first two installments? Check them out here: Part 1 - Click here; Part 2 - Click here. Today's post will be more specific to Disney/Orlando Parks. We're going chat today about park tickets.